The program is about avoiding, recognizing and solving problems on the surface and under water. The course runs two – four days in which you will participate in academic and in-water sessions in the pool and in the open water. As a prerequisite for certification you need to have a valid CPR & First Aid certificate. The program is about avoiding, recognizing and solving problems on the surface and underwater. The course runs two – four days in which you will participate in academic and in-water sessions in the pool and in the open water. As a prerequisite for certification you need to have a valid CPR, First Aid & Oxygen Provider certificate. 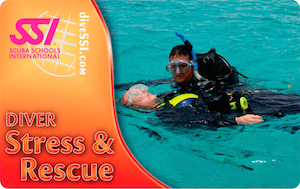 If you want to learn more about DIVER STRESS & RESCUE, you can buy the manual or the DVD even if you don’t want to sign up for the course.